In last article Orders Management in Salesforce – Part 1 I have gone through the way to Enable, Create and Activate Order. In this article I will be going through Deactivate, Delete and Reduction Order, Reports concepts. To activate or deactivate orders it’s required “Activate Orders”user permission in the profile assigned to you. It’s best practice to create separate Permission Sets and grant this permission. Create a Permission Sets and assigned “Activate Orders ” App permission. Now Assign this Permission Sets to the user. Go to the Order detail page, which you want to deactivate. Click on Deactivate button to deactivate the order. 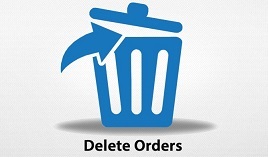 To delete an order, navigate to the Order detail page and click on Delete Button, As shown in below image. To delete an activated order, users must first deactivate it. If an ordered product has been reduced, users can no longer edit or delete the order product in that order. To edit an activated order, users must have the “Edit Activated Orders”user permission. If an order has an associated reduction order, users can’t edit the order’s end date. If an order product has been reduced, users can no longer edit or delete the order product in that order. 1) Once an Order is activated, You can see Reduce Order button on the Order detail page. 2) It will redirect you to New Reduction Order page, Fill the all required details and Click on Save. To reduce an order, users must have the “Create Reduction Orders”user permission. An order must be activated before users can reduce it. Users can’t reduce multiple orders with a single reduction order. Users can reduce up to 200 order products in each reduction order. Order products must have been reduced before a reduction order can be activated. If a reduction order has been activated, users can’t delete its order products or add new ones. You can also create custom report types as per your business needs.